INDIANAPOLIS – The Butler Bulldogs were without their top scorer, but that didn’t seem to matter as they handled Richmond 62-47. No. 13 Butler (15-2, 3-0) retained their status as one of the league’s unbeatens as they climbed to 12 consecutive victories with their win over the Spiders (11-7, 1-2). 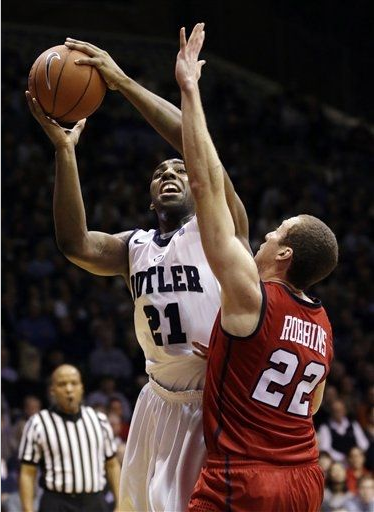 This was Butler’s first Atlantic 10 home game. Led by Senior Andrew Smith with 15 points and Freshman Kellen Dunham with 11, the game was close in the first few minutes until the Bulldogs pulled away with thirteen minutes left in the first half. The Spiders pulled within four at the 8:24 mark in the first half, but the Bulldogs responded with an 8-0 run to lead 23-11. Butler built a 20 point lead in the second half before the Spiders made their final run, but the score was never closer than nine points. Richmond was led by Senior Darien Brothers with twelve points, but the rest of the team was balanced with five players making at least one three-point goal and all nine players seeing at least twelve minutes. However, Brothers was the only Spider to reach double figures. Ultimately, the Spiders’ inability to pull down rebounds is the most telling statistic, as they pulled down only 20 rebounds (6 offensive) to Butler’s 53 (20 offensive). Richmond’s 47 point performance was its lowest output this season. They came into the game averaging 71.2 points. Richmond faces another unbeaten A10 team at home on Saturday when they take on Charlotte (15-2, 3-0). Butler will become the first A10 program to host ESPN’s College Gameday on Saturday as they take on No. 8 Gonzaga (16-1) in the Bulldogs’ last nonconference game of the regular season. The Bulldogs will be without Rotnei Clarke, who may return Jan. 23 when they travel to La Salle.